"Ride out the Apocalypse with me?" asked 710 as we lay in bed at 05:00 yesterday morning. Clearly he had looked at his phone sometime during the night and saw the results. Something I wasn't willing - or able - to do. All night I had dreams. The subconscious never strayed too far from the conscious. Every vignette was me seeing or hearing news teasers that could put the final election victor in either candidates corner. I remember feeling a sense of calm, that even with the results I was seeing a few hours before, that there was still no way Trump could win. I guess that's why they call them "dreams". They are unobtainable visions that border on fantasy. After walking the dog and eating breakfast, I found that I couldn't - and didn't - open one news link. I didn't open my laptop or sneak a peek at my phone. 710 and I sat in silence for an hour - the only words exchanged being about Shep and that I was leaving for the office. 710 made me hug him goodbye. He needed it. I probably did too. I avoided Facebook and its comments. I didn't read texts people had sent me. Did not look at my email. I drove to work with my iPhone playing - - no radio. We, as a country, get what we deserve. We are not educated enough to select a leader of the free world. Overall, we read at a 6th grade level. Math comprehension is even lower. Worse yet, we as a nation are ok with this. We're not only ok with this, we encourage it: for eons the GOP is first in line to cut education spending. It pays for them to keep people stupid. Well, it keeps them in a job. The downstream effect is that all those outsourced jobs that Trump claims will return, won't. First off, companies cannot afford to hire them stateside (well they can, but that cuts into profits - so they won't). Secondly, most people here are not qualified to do them. They don't have the education. New usually breaks down the race and gender of the voters. Two nights ago, CNN (?) did it by education level. It is no surprise how that went, right? But as Trump said, he loves the poorly educated. And they just got him elected. Now they'll find he will do nothing for them. Yesterday - and today? - I was profoundly....something. Sad? Upset? Queasy? I can't quite put my finger on the feeling. It will sound over the top, it will sound wrong to most - but the only feeling to which I can equate the outcome of this election is 9/11. Yes, I know it's very Rudy Guliani of me to bring it up, but maybe it's some kind of PTSD. The evening of 9/11, sitting and watching the news, I had a similar, hard to define feeling in my gut. Yesterday, I went through the day without one laugh and it is doubtful I even smiled. I honestly don't know what the next four years will be like. I mean, I get the general gist of the horror and ineffectiveness that is to come. Ok. Maybe I smiled a little at that one. Ok - that one did make me smile too.....but just a little. Oh - and on the title image? 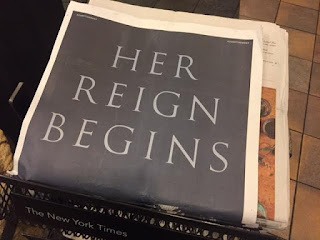 What I am guessing is now a seemingly ill-thought out ad campaign for the Netflix show: the Crown. 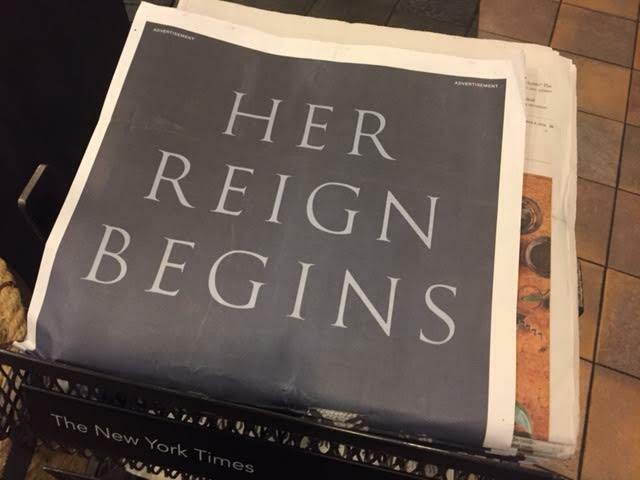 Yes, that full page ad was wrapped around each and every New York Times yesterday morning - and I'm guessing the marketers were trying to tie it in to what seemed to be an inevitable Clinton win. spouse and I are still numb. I could not eat, would not speak or smile. I spoke the bare minimum at work. the only people I can trust are my cats. when are the "whites only" signs going to be posted?